Maxillofacial prosthetic education plays a vital role in providing patients with maxillofacial defects access to specialists equipped with the appropriate attitudes, knowledge, and competence to apply their skills towards providing the most effective prosthetic rehabilitation treatment. As the number of graduates from recognized maxillofacial prosthetics programs is increasing year by year, it is important to improve and develop the teaching and clinical skills for young educators. This is a first workshop of biannual-based workshops. 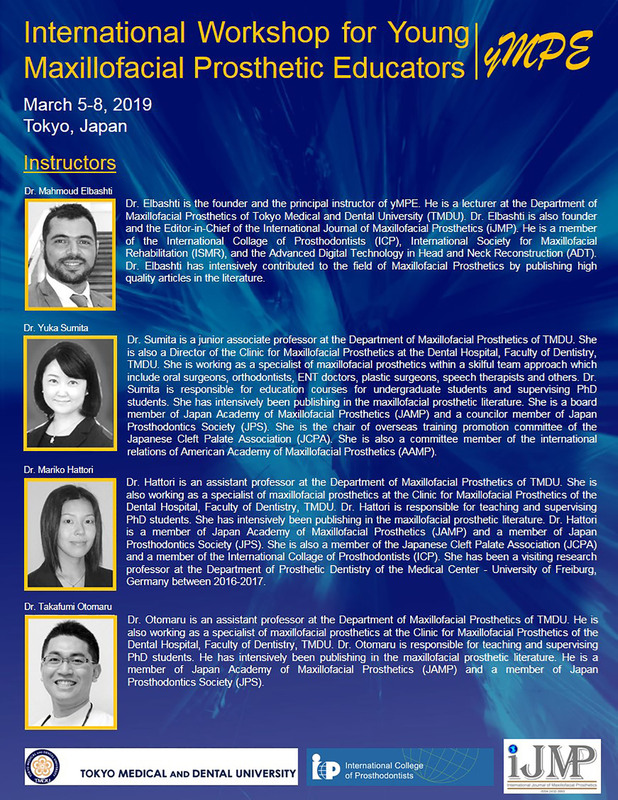 This workshop will take place March 5-8, 2019 at Tokyo Medical and Dental University (TMDU), Tokyo, Japan. It will be organized by the Department of Maxillofacial Prosthetics of TMDU and supported by an education grant funded by the Education and Research Foundation of the International College of Prosthodontists (ICP). This workshop is also sponsored by the International Journal of Maxillofacial Prosthetics (iJMP). •	Develop and improve the teaching and presentation skills of young maxillofacial prosthetic educators through intensive lectures and presentations that will be given by highly experienced educators in the field of maxillofacial prosthetics. •	Introduce up to date digital technologies that used in the education and research for maxillofacial prosthetics and discuss the benefits that can be used for teaching purposes. •	Develop and improve the clinical supervision of students for young educators through clinical observation and discussion of various maxillofacial defect cases and propose the effective prosthetic treatment for these cases. •	Develop and improve the research methodology for young maxillofacial prosthetic educators through review of various journal articles dealing maxillofacial prosthetics. 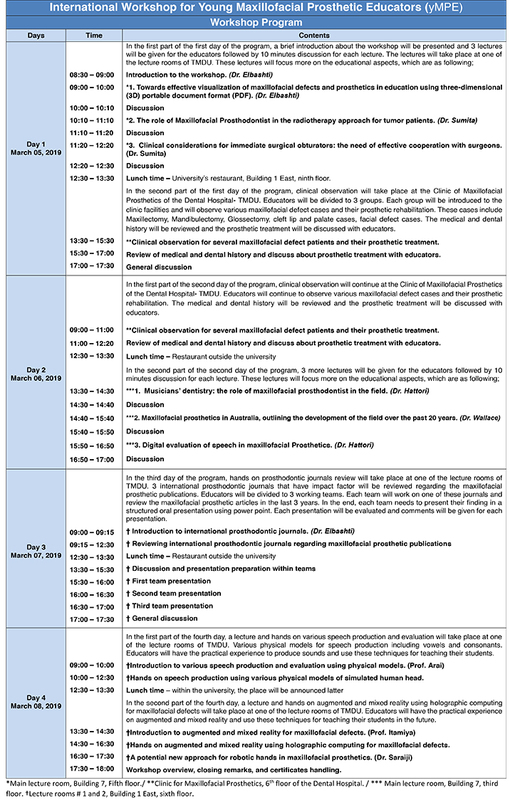 This is a 4-day workshop program that will be limited to 12 young maxillofacial prosthetic educators worldwide with a 60 % of participation selection is given for educators from developing countries. Candidates should be early career academic staff attached to an educational institution that provides maxillofacial prosthetic education courses and clinical services for maxillofacial defect patients. Each candidate should submit an application form, a curriculum vitae (CV) and a letter of recommendation from his/her department head or school dean. It is important to note that the flight ticket or a high speed train (Shinkansen) ticket within Japan is not supported by the workshop and all participants are responsible for their own ticket expenses. Please be advised that English is the primary language of instruction in this workshop program. A high level of English proficiency, in reading, listening, speaking and writing contexts, is therefore required. Please be advised that the 2019 yMPE workshop registration is now closed due to reaching the maximum number of 12 applicants. Thank you for your applications! Please contact Dr. Mahmoud Elbashti on mahmmfp@tmd.ac.jp for any questions or for more information.